Something's Lurking: Rob Zombie's Return to Horror With Ambiguous Trailer. Rob Zombie's Return to Horror With Ambiguous Trailer. Rob Zombie has said that he's done making horror films. Maybe the well is dried in that department for him. However, many rumors have recently circulated about another Halloween film. Halloween 3D. I can't say I'm elated to see it, but I'm a fan of Zombie's work. If the rumors turn out to be true and he is making another Halloween movie I'll go see it. With all that said, the topic tonight is on Rob Zombie and a new find from his website. Here is a trailer for Rob Zombie's next film, 31. I'm not sure what the hell it's going to be about but I'm intrigued. Fans are encouraged to sign up for his email list to get more info on the film. This trailer is ambiguous and doesn't give us much to sink our teeth in. What is 31? What does it mean? Will it tie into the Halloween films somehow? Clearly the image is of a clown. 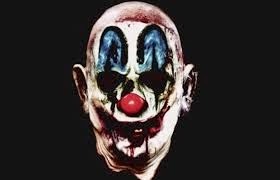 Will Sid Haig return in some sort of prequel, or spin-off, and reprise his role as Captain Spaulding? Is this an entirely new film with original content and characters? Will Sherri Moon-Zombie play Gacy? Okay, that was a joke but at this point your guess is as good as mine. Here it is. You decide!